Mega Millions: Should Winner Take Annuity or Lump Sum? With the Mega Millions jackpot at half a billion dollars, many are fantasizing about what they would do with all that dough. A new mansion in Lake Como? A yacht to sail the Amalfi coast? My personal favorite: dive into a pool of hundred-dollar bills à la Scrooge McDuck. The odds of winning are slim: one in 176 million. But whoever gets lucky (the next drawing is Friday night) will face the practical choice of taking the money on a yearly basis, or opting for the mega lump sum. If the jackpot is $500 million, that means the cash option would yield a one-time lump sum payment of $359.4 million. The annuity option would provide estimated payments of $19,250,000 a year over 26 years. That's more than a million dollars a month, every month, for the next 26 years! Remember, those numbers are pre-tax. Right off the top, the lottery withholds 25 percent for federal tax, then, depending on where you live and your tax bracket, another 6 to 9 percent for state taxes. The sheer amount of money is mind-boggling. "We've never seen anything like this," said lottery spokesperson Elias Dominguez with a laugh, "It's almost scary." Dominguez said Mega Millions does not try to sway winners one way or the other, though they do provide every winner with a handbook with advice -- namely to get an attorney and a financial advisor. They have no hard numbers, but generally most people take the lump sum. "Most of them want all their money now. They're not sure what's going to happen in 26 years. Plus, people think they can take that lump sum and invest it and make more money on their own," he said. Clearly, the upside to the lump sum is having access to all that money to do as you please. But spreading the payments over time guarantees a steady income stream, and can help reduce taxes. Age may be a consideration, though Mega Millions promises to continue to send out those checks every year, even if the winner dies, to a designated beneficiary. Economist Austan Goolsbee, a professor at the University of Chicago who also chaired the White House Council of Economic Advisers, says the choice comes down to interest rates. And with interest rates at zero, the lump sum just makes better financial sense. "If you are fortunate enough to win the lottery, you most certainly want to take the lump sum," Goolsbee said. Here's why: to fund the lottery, the lottery operators buy a zero coupon bond, which is a type of bond that ultimately pays the full amount in the final year. In this case, the bond value $500 million paid in the 26th year. So the value of that bond today is the lump sum. As the interest rate goes down, the value of that bond shoots up, because the lottery deducts the interest rate every year over time. So, in normal times, when the interest rate is say, 3 to 5 percent, Gooslbee said the value of the lump sum was about half the stated value of the lottery. But today, with interest rates near zero, the lump sum is worth much more. "Whoever wins, they should go thank God, and then the second person they should thank is Ben Bernanke because he just gave them an extra $90 million," Goolsbee said. This calculation only changes when interest rates rise, and since the Fed chairman has indicated he's not raising rates until at least 2015, Goolsbee said the choice is clear. Of course, there is the matter of self-restraint. Can you trust yourself not to spend all that money if you have access to it? Consider the cautionary tale of Jack Whitaker, who won $314.9 million in the Powerball lottery in 2002. At the time, Whitaker, a West Virginia businessman, was the largest single jackpot winner ever. He went for the cash option of $170 million, and after taxes, ended up with $114 million. But after several high profile brushes with the law, including large cash robberies, Whitaker lost most of the money, and was the subject of several lawsuits. The Lottery Post dubbed him "the un-luckiest lottery winner ever." 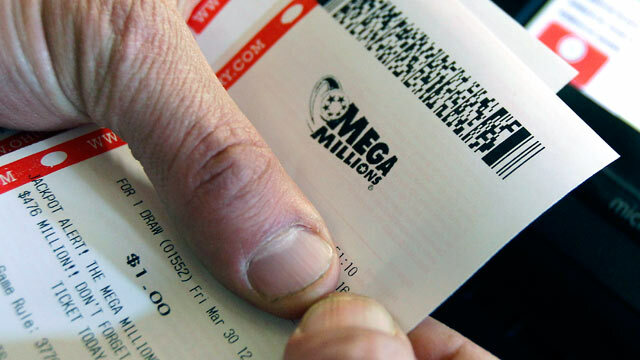 Mega Millions: Annuity or Lump Sum?